Where does the Pantagraph get their numbers? Does Normal not know how much debt they are in, or is the Pantagraph making up numbers? Not a “nearly $94 million” debt load anywhere! Note: Chris Koos and Pamela Reece don’t have a problem with any debt they can raise taxes to pay. If this debt was worth it, the taxes citizens of Normal pay wouldn’t keep going up EVERY year. 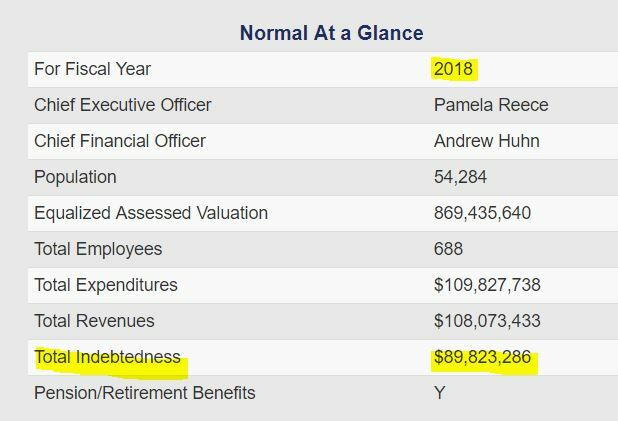 If this debt was worth it, the Town of Normal wouldn’t have recently forced some employees to retire to balance the budget. If this debt was worth it, the police and fire pension funds would be fully funded. Obviously the definition of success to Chris Koos isn’t rooted in reality. Look for him to quit sometime next year, probably citing health reasons. Looking at the empty space across the street from his office might be contributing to health problems. At least the debt is decreasing – until Normal decides they need that sports complex. Another “we want it” that will never pay for itself. So anybody with brains running for office? Posted in BloNo, elections, Koos, Liberal Media, Local, Normal, Pamela Reece, Pantagraph, pensions, Progressives, Taxes.Tagged Chris Koos, Debt, quitting mayor, tax increases, TOWN OF NORMAL. Just another example of how our media (The Pantagraph & WGLT News) are complicit in lying and fabricating facts to advance the narrative of the establishment here. I can see an upcoming article talking about ideas for creating a bronze statue of Mayor Koos to be placed in Mark Peterson Plaza. My question is: When will the people of Normal retake control of their city and send these clueless elites back to the asylum? Hey! you don’t JUST name a place “UPTOWN” you have to PAY for a name like that , and of course pay the dues!! Koos and his cronies have built their utopia, NOW they should ALL go to Santa Cruz, Berkeley, Boulder, Portland or where ever and SEE how it’s done with CLASS!! Of course THOSE places don’t have a Rt 66 museum or a ONE UPTOWN mud bog! I’m hoping to meet with the Republicans and/or Libertarians and see who they might have in the bullpen, and throw my name in for something if they don’t have a full slate between them. Normal needs three people running as a team. Until At-Large elections are transformed into Wards, it is the only way to get elected because the establishment helps their candidates. Then, more citizens have to VOTE! Agreed. The elites are very well coordinated and their campaigns are choreographed. As Lawrence451 mentioned, they also control the media and thus messaging. So it’s an uphill battle. There’s strength in numbers for sure. The last couple of weeks have provided ample political ammo for a new, fresh face. By the way, we never see the Republican or Libertarian Party in McLean County speak out publicly against the lavish spending and failed policies of local government-led/controlled economics. Why is that? Pravdagraph don’t consider that news of the “party” It has to be “cleared’ by the Komitat! That and since it’s not discussing liberal spending or bringing underwater goat tail weaving to UPTOWN they won’t cover it..
One would think they would state a lower number instead of a higher one! The Pantagraph is an example of rip ‘n read news. If it is not in the press release they make something up. Another example of rip ‘n read was the propaganda piece put out by McLean county reported last night. The Pantagraph made a big deal out of the fact real estate taxes are going to be lower (the multiplier_ next year. The reporter being lazy just put what a taxpayer would pay next year. He didn’t bother to compare it to what was paid this year, Fact: a $160,000 home this year with the multiplier being reduced by 1 ten thousandth of a percent will pay six tenths of a PENNY less. You can’t get quality reporting like the Pantagraph ignoring such just anywhere. Actually if your assessed value went up you will be paying more. That was a Fiscal year 2018 report, than means it is actually lower today !!! It was $89 million in March 2018, paper reports $94 million now? I agree Diane!!!! We need leaders like you in Bloomongton and Normal to DESTROY the big spending LIBERALS!!!! Please save us !!!!! If good people don’t run for office there is nothing I can do. Previous Post Atlanta Library is falling apart!